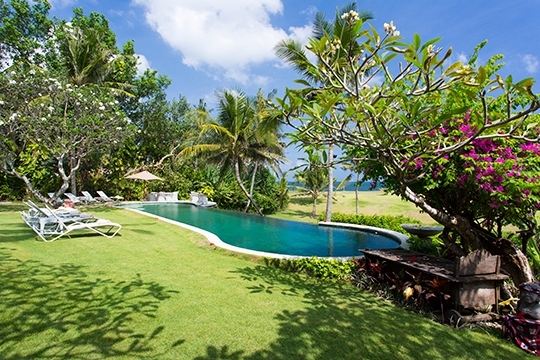 Once upon a time, beachside land in Bali was readily available and considerably more affordable than it is now. 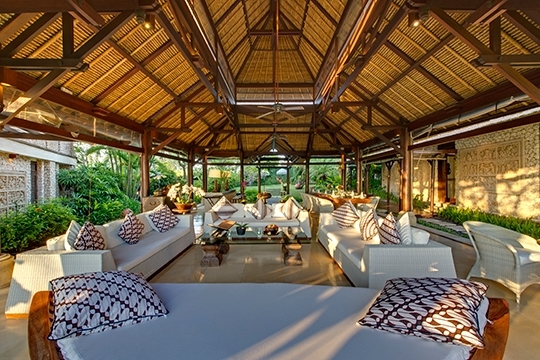 In those days, ‘Bali style’ was charming and romantic; design concepts were inspired by classical Balinese architecture, materials were limited to what was obtainable locally, and the creativity and culture of the island was embraced through stone sculptures, wood carvings and artwork. Nature did the rest. 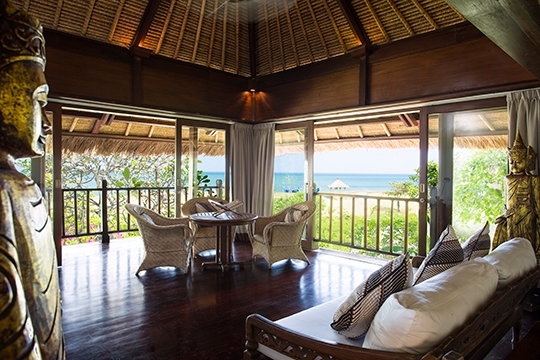 The delightful Sungai Tinggi Beach Villa continues this tradition, leaving ostentation at the door and cherishing the authenticity of Balinese architecture and design. 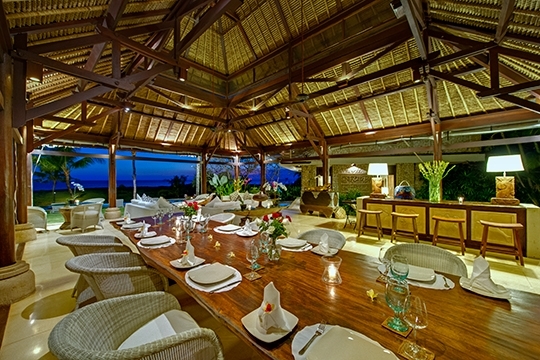 The villa can be rented as a 4, 6 or 7-bedroom property and includes a secluded two-bedroom guesthouse and a great ‘coconut grove’ events space that caters for weddings and celebrations for up to 200 guests. 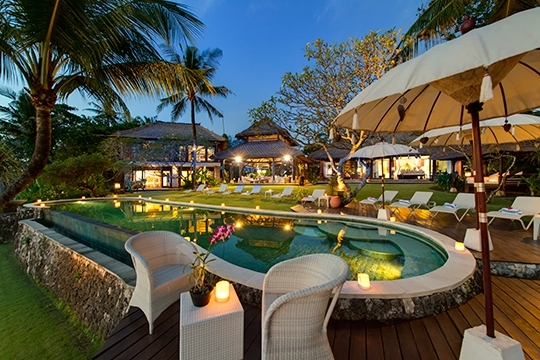 The name means ‘High River’ and this magical villa rests in the arm of a small lagoon, at the point where the river meets the sea. 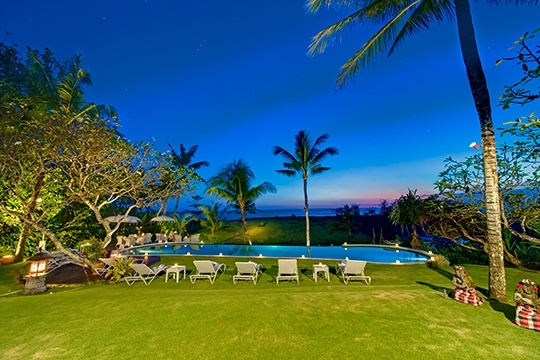 The beach is at the end of the vast coconut-and-palm-strewn garden. 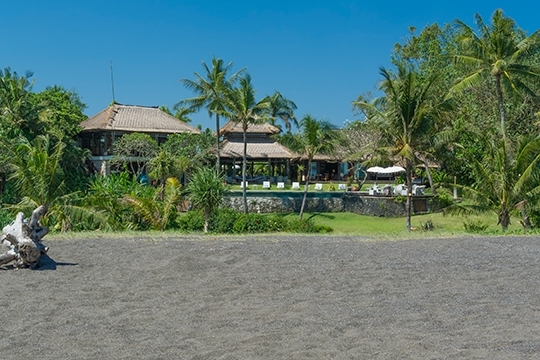 Sungai Tinggi Beach Villa is characterised by coralline-limestone walls, thatched roofs, and an open-sided living pavilion fashioned after a traditional Balinese wantilan, or village meeting hall. 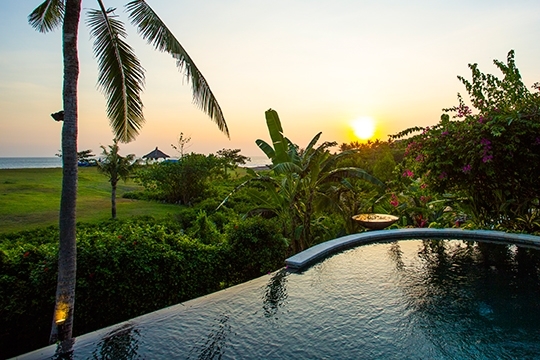 Palimanan stone-carved friezes depict scenes from daily life and Hindu mythology, while water – a predominant element in the spiritual landscape of Bali – is ever-present in fountains, fish-filled lily ponds and the soothing sound of the ocean waves. 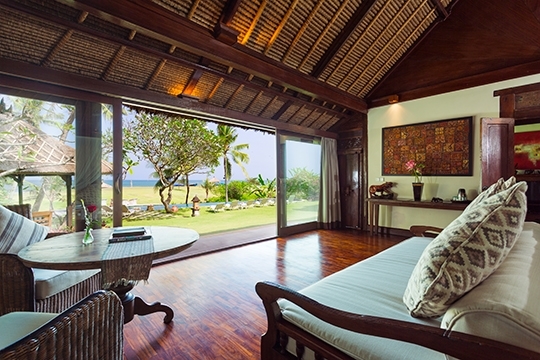 Throw in some sunny open-air bathrooms, romantic four-poster beds, a smattering of Balinese antiques, artwork, textiles, intricately-carved doors, and moss-encrusted statues, and you’ll be under the spell of time-honoured Bali style. Sungai Tinggi presents oodles of outdoor space – including a (shared) tennis court, a green stone pool and lawns scattered with loungers. Flowering dune-vines and pandanas border the lagoon, diffusing the offshore winds and providing a wild and woolly buffer to the sand. 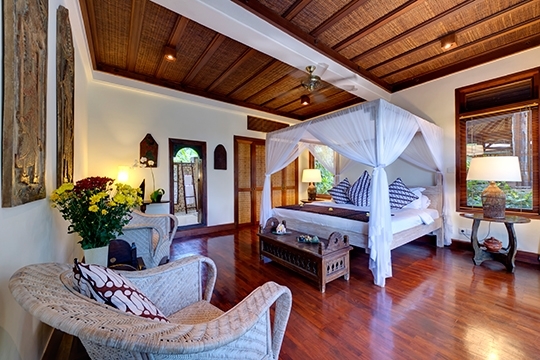 Coconut palms fill the sky and a timber boardwalk meanders its way through the gardens to the beach. Perfect for multi-generational groups or family holidays, Sungai Tinggi Beach Villa is serviced by a full-time team of staff including a very capable cook, who will also take care of the grocery shopping (on guest account plus 20%++ handling fee). This is a place where you can leave your shoes at the door. Talk about bliss! 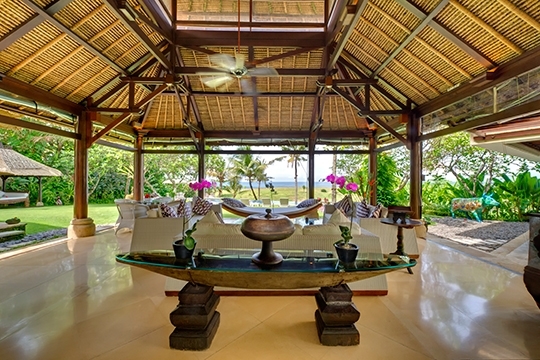 A rare beachside villa that embraces the authenticity of Balinese architecture and design. 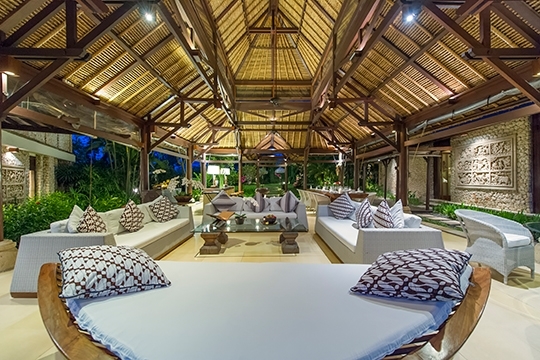 After entering the villa and traversing a pond flanked by a pair of bubbling water features, guests will find themselves in the open-sided living and dining pavilion, with its lofty two-tiered thatched roof and terrazzo floor. The room is furnished with a dining table for 14, a small table for four, and a sitting area with three sofas grouped around a coffee table. 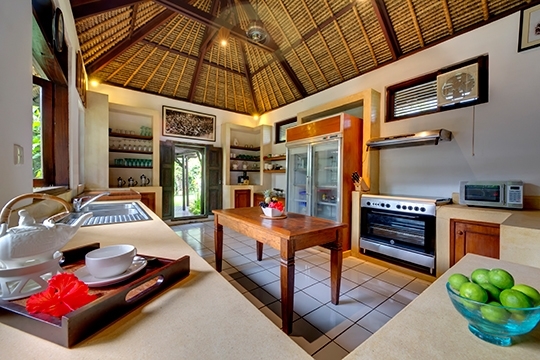 (A separate building by the entrance houses the gleaming white kitchen where the villa chef whips up wonderful meals). 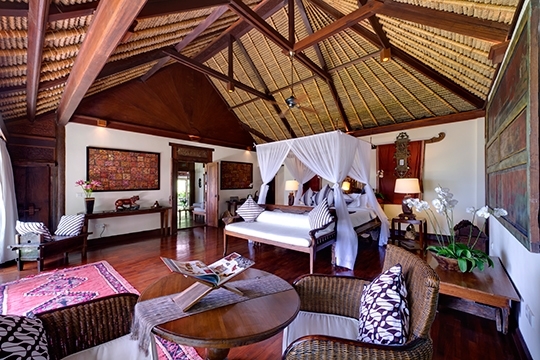 On one side of the living pavilion is a lounge room, guest shower room and the master suite whilst on the other is a two-storey building housing three ensuite guest bedrooms and a delightful upper-floor lounge. 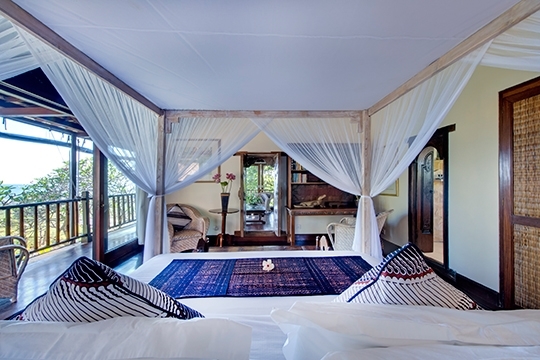 Each of these air conditioned bedrooms faces the garden and is fitted with parquet floors and furnished with a king-size bed, oriental rugs, lovingly-collected antiques, classic artwork, colourful antique wall panels, artefacts and local textiles, complemented by fresh flowers galore. 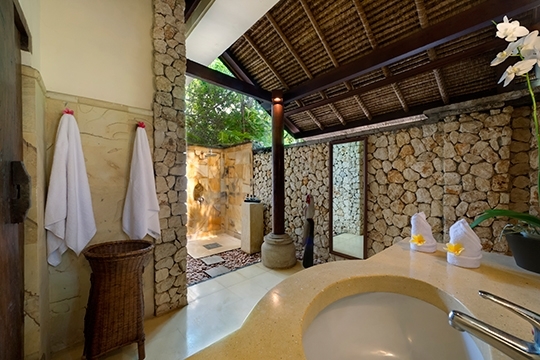 Three of the bathrooms are equipped with oversized circular or sunken terrazzo soaking tubs, all have standing monsoon showers, four extend into the open-air, and all are exceedingly romantic. 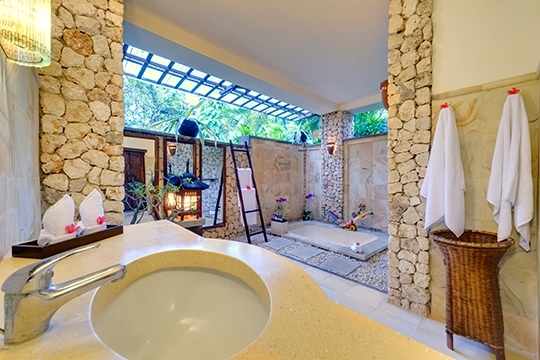 The outsides of the buildings are clad with random rock limestone and hand-carved stone murals, and this is a feature that continues within the bathrooms. The cosy air-conditioned media room offers sofas, a TV/DVD player, a desk and a library of books and movies, and attaches to a bathroom. 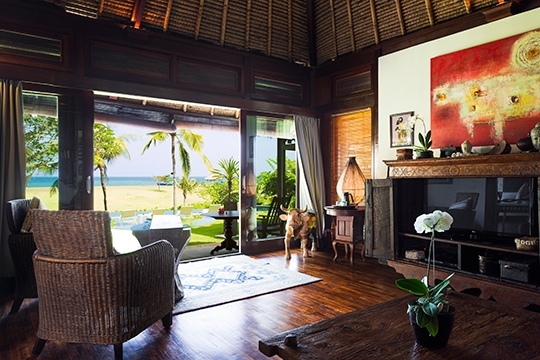 Finally, the upstairs lounge enjoys stunning sea views and is furnished with comfortable chairs and a huge daybed set around coffee tables before a TV/DVD player. 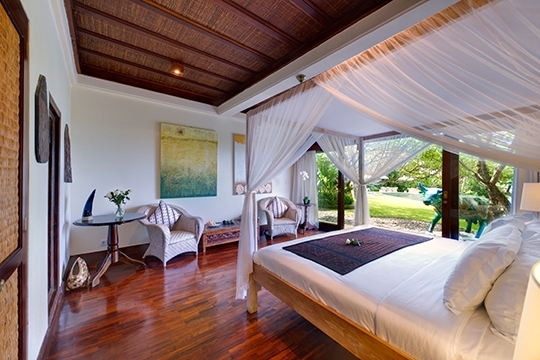 At the river’s edge, a short stroll from the main house, is a private and romantic two-bedroom teak guesthouse with plunge pool. 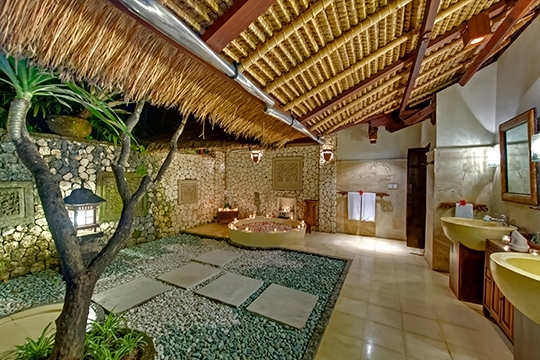 The king and twin bedrooms here are equally sized and share a bathroom huge circular bathtub and monsoon shower. 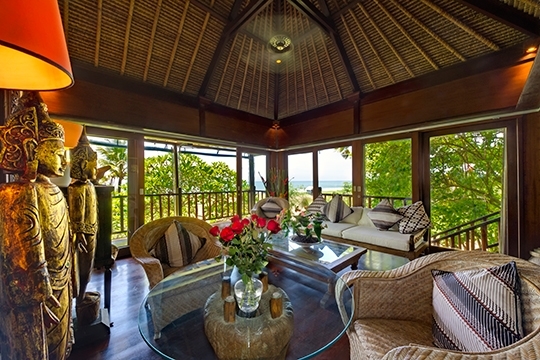 Sofas in the spacious lounge face a 42-inch TV, DVD player and music system, and on three sides sliding doors open onto a veranda furnished with rattan chairs. Beyond, is an alfresco dining table for six. 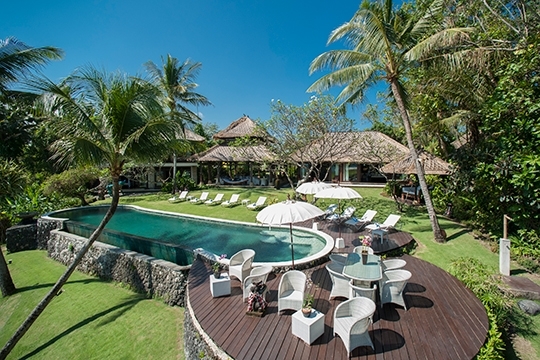 The villa’s garden features smooth rolling lawns dotted with frangipani trees and palms, and a stunning infinity-edge swimming pool bordered by a timber deck furnished with chairs and sun loungers. A gamelan of three stone musicians rests under a tree, and a thatched pavilion presents a huge, deeply-cushioned daybed. It is the view, however, that will stop guests in their tracks. 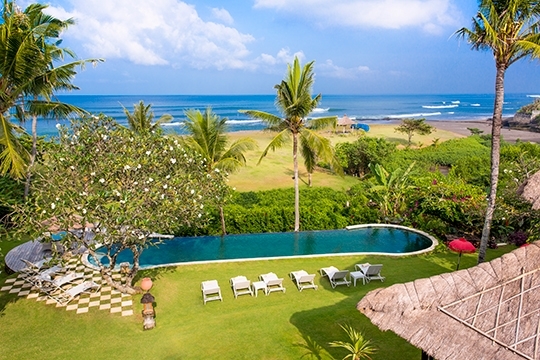 The garden becomes a jungle of pandanas and beach convolvulus as it rolls down to a river, and ahead rises to a buff, immediately beyond which is a rugged surf beach and the Indian Ocean. 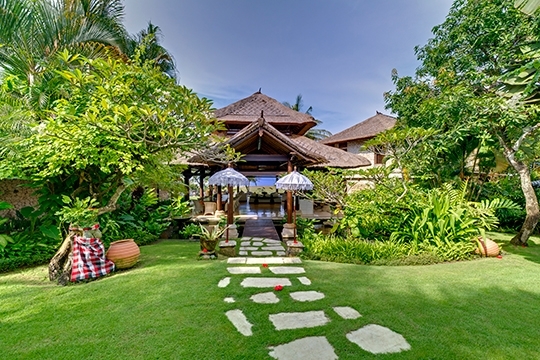 6 bedroom villa located in Canggu, Bali. 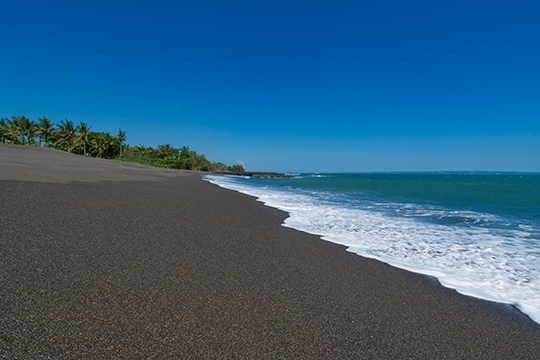 Ideal for Beach in ten, Beachfront, Body and soul, Bring the relatives, Kid friendly, Going for golf, Fair share for groups, The great outdoors, Sensible for seniors, Room with a view, Perfect for weddings. 9 out of 10 based on 88 user reviews.